The best bet for Ukraine (and Georgia and Moldova) might be to work toward the revival of an old Polish plan called “Intermarium” – an alliance of the countries located between the Baltic and Black Seas. The main reason for the recent escalation of tensions in Eastern Europe is the absence of an effective security structure encompassing such militarily weak countries as Moldova, Georgia, and Ukraine. While Ukrainian public opinion has recently made a U-turn from a rejection towards an embrace of NATO, the Alliance will not be ready to extend its commitments farther east anytime soon. Although future enlargement of the Alliance is possible, Ukraine’s confrontation with Russia as well as Moscow’s anti-Western stance would have to decrease significantly for that to happen. Recently, the opposite tendency was on display: The more aggression the Kremlin has shown, the less likely it is that the North Atlantic Council will open its doors to new members in conflict with Moscow. Against this background, the best bet for Ukraine (and Georgia and Moldova) might be to work toward the revival of an old Polish plan called “Intermarium” – an alliance of the countries located between the Baltic and Black Seas. After World War I, Poland and other newly independent states found themselves in a fragile situation between the Russian/Soviet empire and Germany. This led to the idea of a coalition of the lands of what is in Germany called Zwischeneuropa (in-between Europe). Never implemented in the twentieth century, an Intermarium today could help embed countries like Ukraine in an international security structure. Such an idea is not only popular in Ukraine but also in Poland, where President Andrzej Duda recently brought it up. Yet these EU programs and other international institutions do not address Georgia’s, Moldova’s, or Ukraine’s basic security challenges. Therefore, they should be connected with an Intermarium designed as a regional organization for mutual defense against Moscow. Such cooperation is already taking place on a bilateral and sometimes multilateral basis between, for instance, Ukraine, Poland, and Lithuania. In general, there is much common ground between the post-Soviet republics of the South Caucasus, Eastern Europe, and Baltic states leading already to significant cooperation today. Potential member countries of an Intermarium may include Azerbaijan, Bulgaria, Estonia, Georgia, Latvia, Lithuania, Moldova, Poland, Romania, and Ukraine. In Slovakia, the Czech Republic, and Hungary, a future domestic political change could create support for their participation in an Intermarium. Moreover, such a pact would benefit from considerable sympathy throughout Scandinavia and the western Balkans. 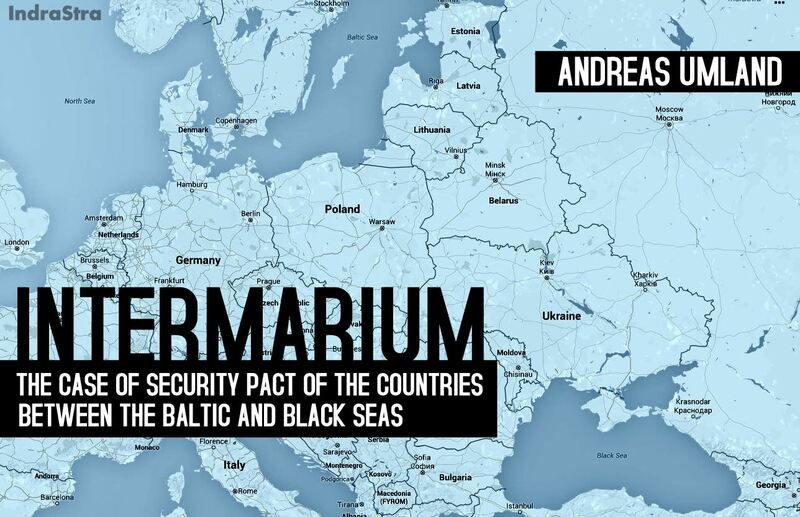 Brussels, Washington, and Berlin should view the Intermarium not as a competitor or nuisance, but as a chance to achieve a provisional but encompassing security structure for Eastern Europe and the Black Sea region. During the coming years, NATO and the EU will not be able or willing to provide plausible security assurances to the nations of Zwischeneuropa and the South Caucasus. Against this background, a mutual aid pact between them and their NATO friends is Ukraine’s second best option to achieve some international embeddedness. By promoting the creation of an Intermarium, the West would outsource some thorny questions in its dual role as ardent foreign democracy promoter and hesitant European security provider. The only way for Ukraine today is Intermarium geo-political union. Not European Union but Intermarium! It is future for Ukraine, Poland, Lithuania which can be followed by Finland and other Baltic countries, Slovakia, Rmania, Bulgaria and even Turkey.